Among the two or three core competencies keeping RIM afloat in a post iPhone world, BlackBerry Messenger, or BBM, ranks at or near the top. 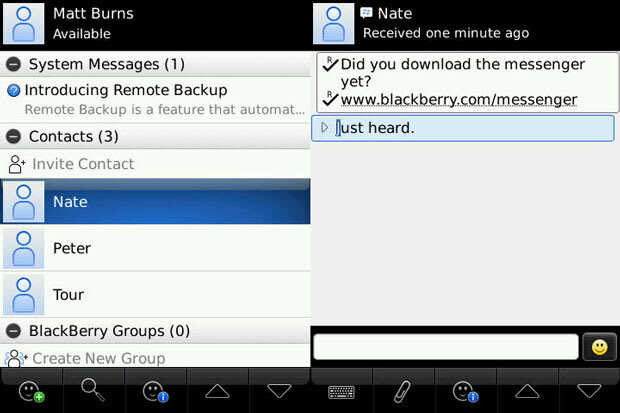 BlackBerry users love it. There&apos;s a whole network of keyboard obsessives who use RIMs dedicated servers to type out super secret (not really) messages to other members of the clique. But soon, that ecosystem may be expanding... to Android and iOS. Boy Genius Report has sources who claim that In order to compete with ascendant copycat services like Kik and WhatsApp, RIM is planning to branch its signature service to Android and iOS via an app of its own. Such a move could obviously seriously damage one of the essential features keeping customers on team BlackBerry. But it could also help RIM dominate an emerging sector of the app market if they deliver the premiere alternative messaging solution. Having a life outside of BlackBerry devices themselves could be key for RIM in the future as the mobile wars claim more victims. If the BBM app does happen, may we suggest making it side-chick proof?